WHEREAS, the creation of a Pennsylvania Redistricting Reform Commission would engage citizens, subject matter experts, and other interest groups in examining Pennsylvania’s redistricting process and making recommendations on ways to drive positive change in our system. Purpose. The purpose of the Commission is to study best practices related to non-partisan redistricting process, engage the public in a dialogue around principles for a non-partisan redistricting process, and make recommendations to the Governor, President Pro Tempore of the Senate, Speaker of the House of Representatives, Majority Leader of the Senate, Majority Leader of the House of Representatives, Minority Leader of the Senate, and Minority Leader of the House of Representatives to inform the redistricting process. Evaluate and analyze recommendations to improve the integrity and fairness of Pennsylvania’s congressional and legislative redistricting process. Review policies and practices implemented in other states that have reduced gerrymandering in the redistricting process. Create opportunities for citizens to engage in the Commission’s work through public meetings and an online web submission form. Develop recommendations and criteria to minimize the partisan political influence on congressional and legislative redistricting processes. Provide non-partisan redistricting recommendations and best practices for the Governor to utilize during the redistricting process. Provide non-partisan redistricting recommendations and best practices for the Legislature to utilize during the redistricting process. Undertake any additional work related to redistricting as requested by the Governor. Up to five citizen appointees. The voting members identified in Sections 3(a)(3) through 3(a)(8) shall be appointed by the Governor and shall serve at the pleasure of the Governor. Should a vacancy occur among the Governor’s appointees on the Commission, the Governor will appoint a successor. The Commission’s membership shall reflect the diversity of the Commonwealth. The Commission may establish committees, rules, and procedures needed to effectively implement its powers and duties included in this Executive Order. Subcommittees may include advisory non-members, if approved by the Commission’s chairperson. All committees shall be chaired by a member of the Commission. A majority of members of the Commission shall constitute a quorum. The Commission shall hold at least six publicly announced meetings throughout the state before its report is due. Report. The Commission shall provide a written report to the Governor, President Pro Tempore of the Senate, Speaker of the House of Representatives, Majority Leader of the Senate, Majority Leader of the House of Representatives, Minority Leader of the Senate, and Minority Leader of the House of Representatives, that includes its findings from the activities undertaken in Section 2 within nine months of the effective date of this Executive Order. Compensation. Members of the Commission shall not receive compensation for their service on the Commission, except that members shall receive reimbursement for reasonable travel costs and expenditures incurred while performing Commission business in accordance with the Commonwealth’s travel and subsistence policies. The Department of State shall provide staffing to assist the Commission in carrying out the Commission’s responsibilities and duties. All Commonwealth agencies under the Governor’s jurisdiction shall provide assistance and support as needed by the Commission to effectively carry out its purpose, powers, and duties set forth in this Executive Order, so far as is compatible with the authority and ability of each Commonwealth agency. Effective date. This Executive Order shall take effect immediately. Termination Date. 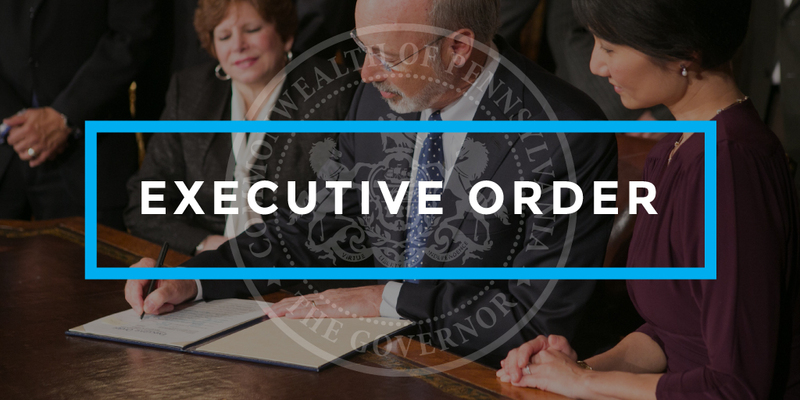 This Executive Order shall remain in effect unless amended or rescinded by the Governor.